WILD ABOUT HARRY: Houdini here! 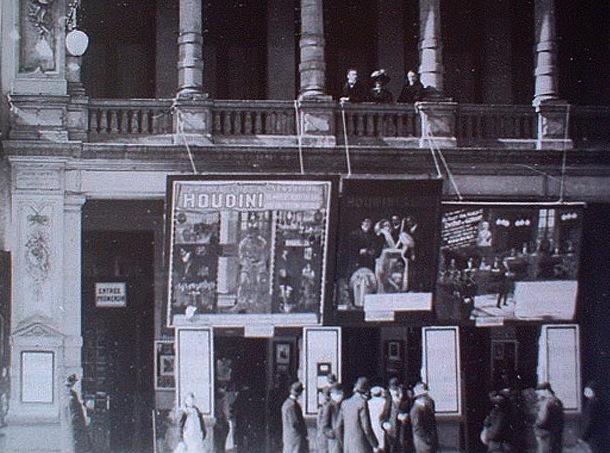 Here's a terrific photo of a theater adorned with three mammoth Houdini posters. I love shots like this because I always learn something. Here we learn that there existed giant sized "Slander in Germany" posters. The only surviving examples of this poster (one of which sold in 2011 for $25,000) are half sheet size. And if you're curious about that poster on the far left, you can get a better look at it here. Because there's a Milk Can poster present, I'd date this photo between 1908-11. And I believe that is Harry and Bess themselves on the balcony. By the way, I have no idea where I got this image. So if you sent it to me and would like credit, just give me a shout. Below are links to photos of some other Houdini theater fronts. UPDATE: An eagle-eyed reader points out a sign in French over the doorway, so I'm guessing this is Barrasford's Alhambra Theater in Paris in 1909. I keep seeing that picture of the milk can in posters but no real photos of it, have you seen any photos of this type of milk can? Do you mean one with the long bands that connect to the shoulder of the can? I've never seen a Houdini can like that. His connected to the rim via short hasps. But there are modern cans that match the poster. One was used in The Great Houdinis. Several pics around this site of that one. I remember reading somewhere, Christopher?, that those long bands that attach below the shoulder in that poster was Harry's way of covering his tracks on the secret of the can. The sign on the first door would indicate this was taken in a French speaking country. So I'm guessing this is Barrasford’s Alhambra Theater in Paris in 1909. The Linking Ring goes "Inside Houdini's 278"
What would Houdini's resume look like?